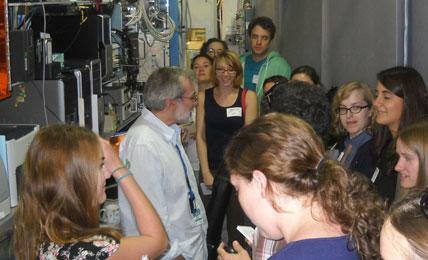 SHERP students take a two-day trip to Brookhaven National Laboratory every year. 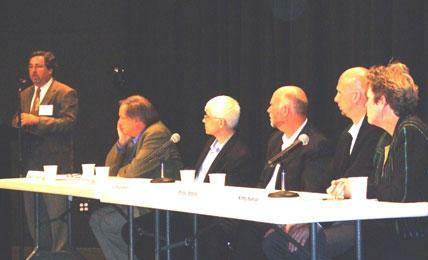 A SHERP-sponsored forum on synthetic biology featuring, among others, geneticist J. Craig Venter. Visiting CNN and meeting with Anderson Cooper. 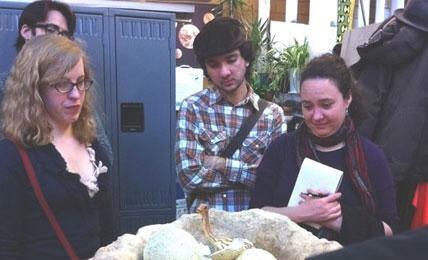 Behind the scenes at the exhibit workshop of the American Museum of Natural History. 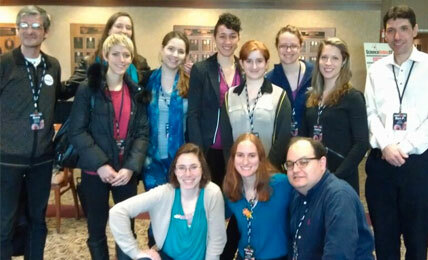 SHERP students, alumni and faculty at the ScienceOnline conference. SHERPies are also regulars at NASW, SEJ, AHCJ and AAAS. A talk about bioengineered prosthetics at Brookhaven National Lab. Learning about space dust research at Brookhaven National Lab. 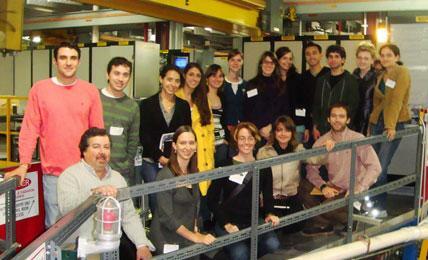 At the National Synchrotron Light Source at Brookhaven Lab. SHERP’s customized curriculum is centered on real-world reporting assignments and case studies, as well as conversations with dozens of prominent guest speakers every semester from the worlds of journalism and science. The SHERP sequence consists of 11 classes (including one elective) over 16 months, for a total of 38 credits. Multimedia training, including video production in Adobe Premier, audio podcasting and data graphic design, begins in the first semester and continues throughout the first year of instruction. Because approximately one-fourth of our recent graduates decide to freelance instead of taking staff jobs, we also provide training in entrepreneurial skills, including self-marketing. In addition to numerous in-class speakers, SHERP hosts the Kavli Conversations on Science Communication at NYU, which are interactive, live webcasts (you can join in!) featuring conversations between leading science journalists and eminent scientists who reach mass audiences. You can see videos of our predecessor “Inside Out” evening discussion series, too. SHERP students also interact with Ph.D. students, post-docs and medical students at NYU who sign up for the Science Communication Workshops, a four-week short course that introduces scientists-in-training to the basics of communicating research to lay audiences. We also bring in eminent science journalists to work with our students and alumni via the Simons Visiting Science Journalist program. In the fall of 2016, we hosted best-selling science writer Mary Roach as our inaugural Simons visitor. Pulitzer Prize-winning New Yorker staff writer Kathryn Schulz joined us in the fall of 2017 as our second Simons Visiting Science Journalist and David Quammen was our third in 2018. Our students also interact with two “visiting scholars” each year who are leading figures in the world of science journalism. The current designees are Maria Konnikova and Melinda Wenner Moyer. Past SHERP visiting scholars have included Carl Zimmer, Mariette DiChristina, David Corcoran, Corey Powell, Amy Harmon and Virginia Hughes. Another new curricular opportunity for SHERP students is the Physics Journalism Fellowship, funded by the National Science Foundation via NYU Assistant Professor of Physics Joshua Ruderman. 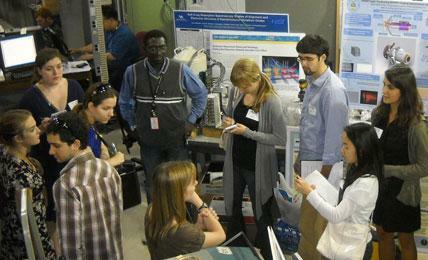 Fellows pursue in-depth reporting projects at the frontiers of physics. The first recipient, Ryan Mandelbaum, visited CERN (the European Organization for Nuclear Research) in Geneva and published this story in Gizmodo based on his fellowship experience. The second, Marl Kaufman, visited Los Alamos National Laboratory and wrote about Martian exploration for Mashable. 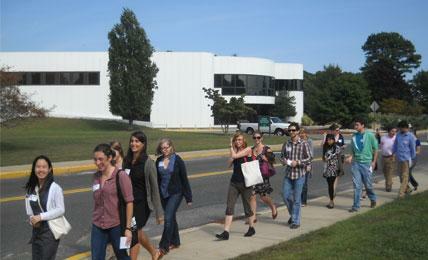 SHERP organizes seminar field trips every year to Brookhaven National Laboratory, The New York Times, the American Museum of Natural History, the Jamaica Bay National Wildlife Refuge and the New York Aquarium. With the help of stipends from SHERP, many students also attend the annual conferences of the National Association of Science Writers, the Society of Environmental Journalists, the Association of Health Care Journalists or the American Association for the Advancement of Science. (SHERP’s faculty includes current or former leaders of all three journalism groups.) There are also fellowship opportunities for students to attend other conferences, including the National Academies Keck Futures Initiative and the Society for Neuroscience. We also host special events. In the fall of 2012, for example, more than 170 alumni, students and friends of SHERP gathered to celebrate our 30th anniversary, which included a panel discussion (watch the video!) with best-selling authors Rebecca Skloot and Mary Roach and Radiolab creator Jad Abumrad. In 2007, we celebrated our 25th anniversary with a full day of events, including a symposium on artificial life featuring famed geneticist J. Craig Venter. The program’s award-winning student-run webzine, Scienceline, is fully integrated into coursework. SHERP students assign, report and edit stories, blogs, videos, audio podcasts and data visualizations, some of which begin as class assignments. Curriculum quick links: first semester, second semester, summer semester, third semester, recent guest speakers, current faculty and past faculty. Writing and Reporting Workshop I (Prof. Robin Lloyd, syllabus, four credits) introduces students to the tools of the trade, while helping them report, write and, most importantly, think like journalists. Students learn the ingredients of a great news story, along with basic reporting techniques such as how to find story leads, track down information sources, and nail an interview. They also learn the principles of how to write with clarity, accuracy and style, and how to make the most of the editing process. In this class, SHERP students are also introduced to the burgeoning world of digital journalism, including blogging, video production and interactivity. They put their new skills into practice with varied assignments, with the aim of publishing their best work in Scienceline. Current Topics in Science, Health and Environmental Journalism (Prof. Dan Fagin, syllabus, four credits) (NOTE: Will be taught by Prof. Charles Seife in Fall 2017) introduces students to the world of science journalism by looking at scientific topics that are at the cutting-edge of research and have profound implications for the way we live. In other words, they are the raw material for great journalism. As students immerse themselves in some challenging areas of current science, they read the work of highly accomplished researchers and journalists and also hear from them directly in class. The goal throughout is to understand and adopt the practices that the best science journalists use when they cover controversial science. Students learn how journalists interact with scientists, conduct research, organize information and write stories. Just as importantly, students sharpen their analytical skills by writing almost every week for Scienceline. Covering an assigned beat, students follow the peer-reviewed journals and other sources to stay on top of the news as it happens. Medical Reporting (Prof. Ivan Oransky, M.D., syllabus, four credits) provides an in-depth look at many of the most important contemporary topics in the always dynamic field of medical journalism, including the biology of cancer, environment-related illness, epidemiology, and the precepts of sound medical research and peer review. Students write several short pieces on journal reports, medical conferences and community health lectures, and one longer, feature-length piece on a health topic of their choice. Medical researchers and prominent journalists are frequent guest speakers. Writing and Reporting Workshop II (Prof. Stephen S. Hall, syllabus, four credits) is an introduction to long-form science journalism. Drawing on the narrative techniques of great fiction, students produce news features, books (proposals and outlines), reported essays, stand-alone videos and explanatory pieces. In addition to these major assignments, there are extensive in-class writing and reading exercises, including character sketches, op-eds and close textual analysis. Most classes also reserve time for an informal “story meeting,” where students will pitch story ideas. This culminates with a formal query letter pitched to a specific media outlet. Environmental Reporting (Prof. Dan Fagin, syllabus, four credits) has three major components. Students focus on writing — and rewriting! — insightful stories about environment-related topics that are often emotionally charged and highly politicized. They also take deep dives into a series of crucial but often misunderstood topics such as risk assessment, epidemiology, environmental law, climate science, framing and the use of databases and other investigative tools. And finally, they read and discuss the work of exemplary environmental writers and thinkers, from Henry David Thoreau and Aldo Leopold to John McPhee and Bill McKibben. As they explore each of these three components, students practice many forms environmental journalism, including news stories, features, topical profiles, blog posts, persuasive columns and descriptive essays. They also critique newly published environmental journalism every week. Investigative Science Journalism (Prof. Charles Seife, four credits) gives students the tools they will need to see through lies and shed light on facts that certain people would rather keep hidden. By the end of the semester, they will be able to sniff out deception and find the facts to uncover it; they’ll also be relentless — unwilling to let go once they seek their teeth into a juicy story. SHERP students will get the mathematical knowledge, investigative reporting techniques, and computer skills that will help them cut through hype and obfuscation, and it will do so by having them perform first-rate investigations on important scientific or medical topics. 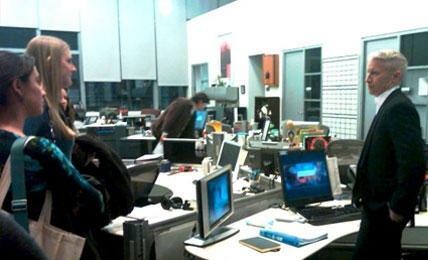 After completing this course, students will be formidable — and dangerous — reporters. Journalistic Judgment (Prof. Robin Henig, syllabus, four credits) is SHERP’s press ethics class. It emphasizes the special dilemmas and unique ethical decisions that come with covering science, health and environmental news. The First Amendment, libel, censorship (including self-censorship), transparency and ethical decision-making are key topics in this class. Fieldwork in Journalism (Prof. Rene Ebersole, one credit) is the first of two required internships. (A few students also intern in the spring.) Preparatory work for the internships actually begins during the first semester of SHERP, when the program’s internship coordinators work with students to prepare resumes and cover letters and assist them in identifying opportunities that fit their interests and aspirations. A Meet the Editors and Producers event, typically attended by more than 30 supervising editors who work with SHERP, is part of this process. Science Writing (Prof. John Rennie, syllabus, four credits) is an advanced class that draws on all the skills students have practiced and polished during the previous year. The goal is to give a realistic preview of life as a working science journalist, from finding a story idea to pitching it to surviving the editing process to making sure the final product is accurate, clear and compelling. The class looks at science journalism from the editor’s point of view, and also emphasizes the process of popularizing complex scientific and technical information for the mass media. Students produce at least one feature-length story, as well as several shorter pieces. The goal, as ever, is for students to write stories they can pitch to professional publications. Elective (four credits each). In their final semester, SHERP students can explore areas of special interest by taking a course offered elsewhere in the Carter Institute (or, by special permission, elsewhere in the university). Possibilities at the institute include graduate courses in advanced television and radio production, data journalism, investigative reporting, business journalism, essay writing, journalism and epidemics, criticism, ethnography and journalism, history of media, literary journalism, cultural reporting, hyperlocal coverage and food journalism, among others. Fieldwork in Journalism (Prof. Rene Ebersole, one credit) is the second of two required internships. During this final semester, the focus is on transitioning from internships to full-time work on staff or as a freelancer. 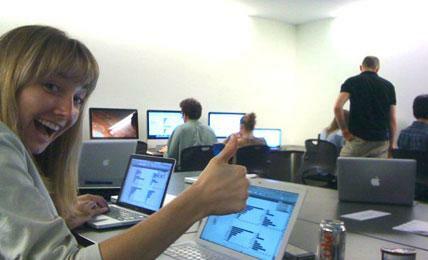 Every year, several SHERP students land full-time jobs at places where they have interned. Belinda Batten, director of the Northwest National Marine Renewable Energy Center. Nathanael Johnson, freelancer and author. Maggie Koerth-Baker, author, blogger and freelance writer.